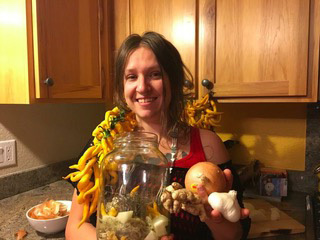 Jamie Scepkowski is a radical kitchen witch, herbalist, EMT, and mother to three from Northern California, with a focus on herbalism as activism. She’s happiest combining herbalism and medic support, volunteering in the MASH clinic for the second year, and as a member of the Black Cap Medic Collective. She has been living a herbal lifestyle for the past 10 years. Jamie is one of the Fire Cider 30, and looking forward to sharing her knowledge with her sisters. The Tradition of Fire Cider! !